This two-volume reference serves as a handbook containing a wealth of information for all isotope chemists working in a wide range of disciplines including anthropology to ecology; drug detection methodology to toxicology; nutrition to food science; and the atmospheric sciences to geochemistry. 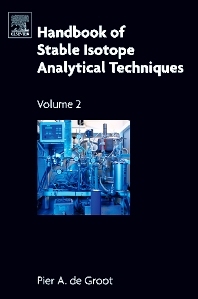 Complementing the first volume, Volume II includes matters that are not strictly confined to the analytical techniques themselves, but relate to analysis of stable isotopes, such as the views on the development of mass spectrometers, isotopic scales, standards and references, and directives for setting up a laboratory. Researchers and scientists working on stable isotope analysis on geochemistry, anthropology, archaeology, agronomy, atmospheric science, biology, biogeochemistry, climatology, drug detection methodology, ecology, environmentalogy, food science or alimentology, forensic science, hydrology, marine science, medical science, metallurgy, meteoritic science, metrology, nutrition studies, paleontology, petrochemistry, pharmacology, planetary science, and toxicology. Hydrogen. Introduction. Water sampling techniques. Hydrogen isotopes in hydrous silicate minerals, total rock samples and waters. Hydrogen isotopes in organic compounds. Hydrogen absorbed in metals. Carbon. Carbon isotopes in organic materials. Carbon isotopes in gas compounds. Carbon isotopes of compounds from water. Carbon isotopes of compounds in rock material. Carbon and oxygen isotopes incarbonate rock and minerals. Carbon isotopes in graphite and diamond. Carbon isotopes in cyanides. Nitrogen. Nitrogen isotopes in inorganic compounds. Nitrogen isotopes in organic materials. Nitrogen isotopes ingaseous compounds: NO, NO2, NH3 and air. Carbon isotopes of compounds in rock material. Oxygen. Oxygen isotopes in silicate- and oxide-minerals and in rock samples. Oxygen isotopes in water. Oxygen isotopes in organic compounds. Oxygen isotopes in sulfates. Oxygen isotopes in phosphates. Oxygen isotopes in carbonates. Oxygen isotopes in nitrates. Oxygen isotopes in metal-oxides. Sulfur. Introduction. Sulfur isotopes in sulfides. Sulfur isotopes in native sulfur. Sulfur isotopes in sulfates. Sulfur isotopes in organic materials. Sulfur isotopes of sulfur in metals. Stable isotopes of: Mg, K, Ca, Ti, Cr, Fe, Ni, Cu, Zn, Ga, Ge, Se. Mg isotopes. K isotopes. Ca isotopes. Ti isotopes. Cr isotopes. Fe isotopes. Ni isotopes. Cu isotopes. Zn isotopes. Ga isotopes. Ge isotopes. Se isotopes. Whole rock sample techniques & stepped heating methods. Whole rock sample techniques. Stepped heating methods. Fluids and gases from inclusions dissolved in rocks or glasses (H, C, N, O - isotopes). Atmospheric - tropospheric - stratospheric compounds. Stable isotopes of compounds in water reservoirs and soils. Water reservoirs. Soils. Experimental stable isotope fractionation determination. Reference materials - standards and related matters. Mass spectrometer correction and calibration procedures. Static mode mass spectrometry for small sample measurement. Spiking and isotope dilution procedures. Appendix A - List of stable isotopes and their relative abundances in nature. Appendix B - Sample preparation methods. Appendix C - Vacuum technology related matters. Appendix D - Chemicals commonly used for stable isotope analytical preparations and their risks. Appendix E - List of theses including stable isotope analytical techniques.